When I planted nine Dutch Flat cabbages last spring, I was envisioning filling my huge crock with homemade sauerkraut. Well, the cabbages didn't do as well as I hoped, and what I harvested at the end of June were on the smallish side. 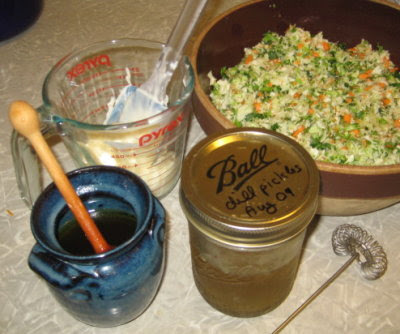 I still might have made them into sauerkraut, but with 4th of July around the corner, I had a hankering for cole slaw. I have a pretty easy recipe, so I thought I might pass it along to you. 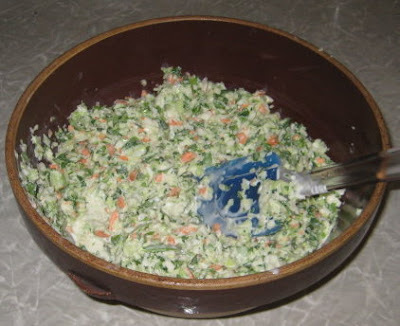 Dan likes a simple cole slaw, with cabbage and carrots only. I'm sure you could add other vegetables, but those two are all I use. I used the last of our homegrown carrots in the first batch, so the ones I'm using here store bought. I simply cut everything in to chunks, and put them in my blender, which has been filled about 3/4 with water. 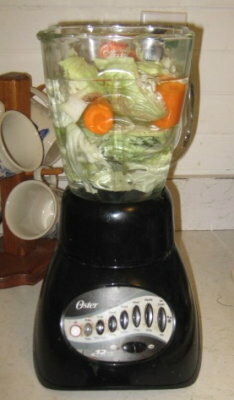 I've learned that carrot chunks can get stuck in the blades, so I always put in cabbage wedges first. It only takes a few seconds to grate. 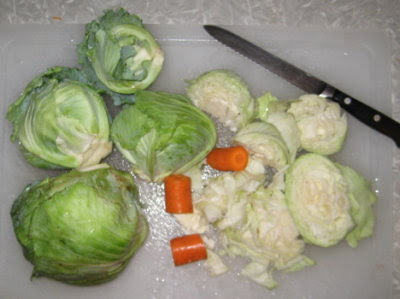 In fact, it's easy to completely juice the cabbage, so I take care to keep an eye on it. I catch and re-use the water from the blender. When I'm done blending, I usually pour it on plants, but really, I think it could be used as a cabbage & carrot flavored cooking water. The other ingredients are mayonnaise (not homemade yet. That's on my list of things to learn), leftover pickle juice from any favorite batch of pickles, and sweetening. Here I have dill pickle juice from last year's homemade, and honey. I whisk them to taste in a big measuring cup. I honestly don't know the proportions, because that varies with the pickle juice and personal preference. After that, it's mix, cover, refrigerate, and let sit for several hours or overnight. If I don't make enough sauce, I just mix up a little more and add it too. I love this recipe because it's simple and quick. It's a favorite summer time salad. This recipe is part of Food Renegade's Fight Back Fridays! For more real food recipes, click here. Are you a cole slaw fan? Looks yummy Leigh, sorry the cabbages didn't work out for kraut! Home-made mayonnaise is so easy, and so good you'll never want to eat store-bought again. You can even make it in the blender. 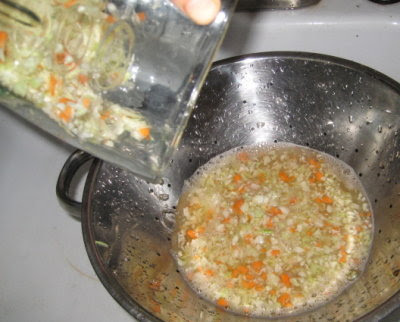 The secret is to add the oil in as thin a stream as you can, to prevent de-emulsification. You even have your own eggs to make them with. My cabbages didn't do as well as I had hoped this spring either. At least the farmer's market was overloaded with them! I love coleslaw. I don't make a special dressing for it, I just a buttermilk ranch that I've made. My husband doesn't care for the "coleslaw" taste, but rather prefers that ranch dressing taste. It's all good. That looks great and yummy. I love coleslaw and prefer it tangy instead of sweet. I have to try this receipe out. Good idea to blend it. I always find my slaws too chunky even when I try to cut/grate the veggies finely. 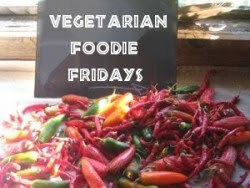 I invite you to link up at my Vegetarian Foodie Fridays carnival if you wish. I'd love to have you! And, I love kraut...oh, how I love kraut!!! Theresa, I suspect Dan prefers the cole slaw to the sauerkraut anyway. I can still make some, it will just be a smaller batch. Geodyne, you make it sound easy! OK, I'll have to give it a try soon. Motherhen68, ranch dressing sounds very tasty too! Good idea. Deep End, the nice thing about making it this way is that the sweetness can be customized. It all depends on the pickle juice. Melodie, I like it that way too and never could get it fine enough on my own. Thanks for inviting me to participate in Vegetarian Foodie Friday! Sara, one of these days you'll need to grow your own cabbages and make your own sauerkraut! Bettina, red cabbage, raisins, and carrots sounds yummy! I do make a carrot and raisin salad, but I never thought of adding red cabbage. I will have to try that. Shopannies, what a great idea! I'm on my way over for your recipe. Give homemade mayo a try. It's really very easy. It took me a couple of tries to get the seasoning right (to my taste, it needs a lot in order not to taste flat, and a little dry mustard is the key) but the basic process is a snap. I make mine in my food processor but I'm sure a blender would work, too. Have it running, and add the oil in a very thin, steady stream. It will thicken some as it chills, but should be pretty thick right away. Enjoy! Looks very yummy. Thanks for sharing, Leigh! But, I'm going to be very sacrilegious in saying that it looks like it would go great with a pulled pork sandwich. I recently made cole slaw and carefully sliced all the cabbage thin by hand. We only have a tiny chopper/food processor so the cabbage doesn't fit. I never even thought of using the blender. Great idea! I'm going to have to remember that for next time. It certainly would be a great time saver. Cynthia, you're the second commenter to say it's easy! I will definitely have to give this a try. I'd so much prefer mayonnaise in the oil of my choice. Penny, it is indeed a time saver. My little food processor actually fits onto the base of my blender, but I've never tried it. I should get it out and see what it can do. It never occurred to me, not even once, to grow cabbage. I don't know why since I absolutely love cole slaw. Out of curiosity, can you taste the difference between your cabbage and store cabbage? Cabbage might be one of those things you could grow too. 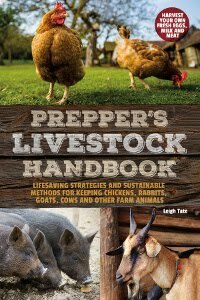 You should check with your county cooperative extension agent. I found our homegrown cabbage to not be as dry and much fresher tasting. The best cole slaw was with our homegrown carrots too, because they were so sweet. I definitely need to plant more carrots this fall. Actually, I think it's time to start planning the fall garden, even though we're in the heat of summer. 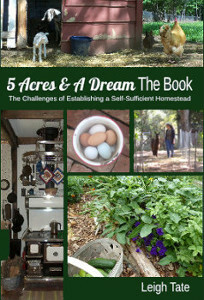 I'd also like to try a hoop house this year!